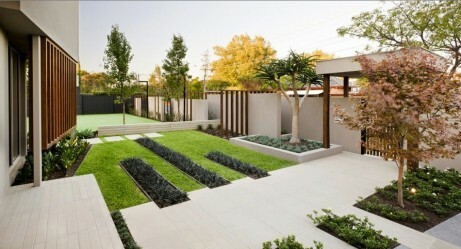 Creating a Stylish Contemporary Garden | Global Garden Friends, Inc. Therapeutic properties of the great outdoors, particularly gardens with their lush greenery and colourful flowers are undeniable and people all over the world are embracing the idea of creating their own little piece of green heaven in the midst of a busy urban life. There’s a special bond between us humans and nature that leads to a relationship filled with clam, piece, patience and trust. Creating your own masterpiece of a modern garden will give you a lot of personal satisfaction but it will demand your time and effort on a weekly basis. In return, it will teach you many useful lessons and give you the opportunity to enjoy in the fruits of your labour. 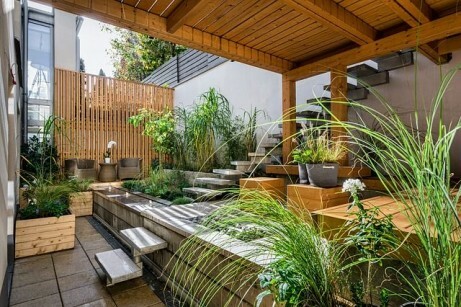 To help you get inspired and started on your garden project, here are several ideas about what it is that defines a stylish contemporary garden. A modern garden today is not viewed as static, but rather dynamic and continuously changing. It emphasises strong graphic and structural elements, unusual materials and clean, sleek lines. Hardscaping elements are very prominent and the whole space incorporates very bold, sharp and visually strong lines. Yet, this modern design is also very adaptable and with a few minor tweaks, easily changed into simple naturalistic, sustainable garden. Typical hardscaping elements of a contemporary garden most commonly include stone, wood and concrete, and it doesn’t shy away from grand focal points, such as water features, sculptures and large plant containers. Other elements you can typically see in are cobbles in a variety of colours and sizes that add texture, concrete steppers that are very versatile and can be great stepping stones, spheres that are cheap but fantastic tools to add an elegant note and a sculptural element to a garden and slick pots, cylindrical or square, made of ceramic, metal, clay or resin, that stand as unique ornaments in any contemporary garden. An important part of your garden design is the landscape layout which plays a critical part in adding warmth to a contemporary look. Think about combining raised and grounded planters with patio areas. In this way, your planting is emphasised and more tangible. If your garden is on a slope, using retaining walls will also elevate your plants and give them a stronger visual identity. Layout your plants in an organized way and go for natural and loose planting manner. It will give your garden an air of playfulness, warmth and vivacity. To tie the whole look in, repeat the patterns: plant your shrubs, ornamental grasses, small trees and box bushes at regular intervals and you’ll achieve a timeless look. The final element of your garden’s structure is its functionality, since any successful modern garden design dictates a blend of style and function. 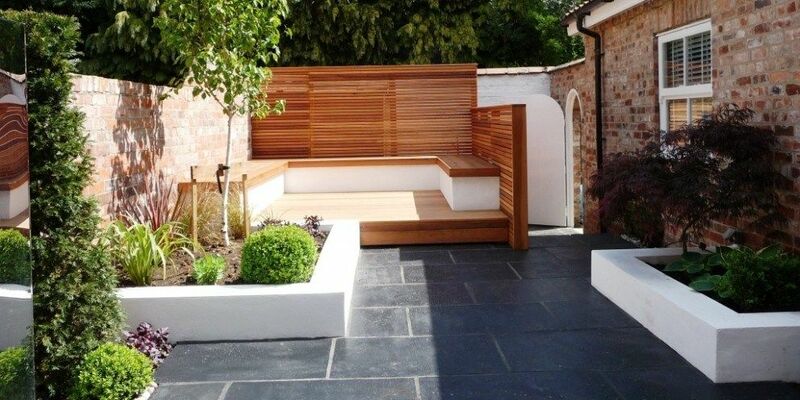 Your home should naturally extend into your garden so its design is equally important. This means your deck or patio space must be practical and comfortable. No stylish contemporary garden patio can be complete without modern furniture such as sofas, chairs, tables and loungers. In order to make it more inviting and cosy, consider adding soft outdoor rugs that will also give the space more definition and texture. Contemporary garden design imposes the idea of minimalism and uses abundantly neat organisation, stiff lines and sculptural plants. In order to avoid a cold look and make a connection with nature, don’t stick only to rigid, architectural plants. With all that elegant hardscaping, opt for natural and loose-looking plantings. Choose perennials strategically as they tend to soften the sharp edges and walkways and add a pop of colour. Start with plants with bold silhouettes close to your house and as you move further, feel free to combine lush plants, ornamental grasses and colourful flowers. This will create a dynamic backdrop so your landscape won’t look like a sterile museum. Your contemporary garden needs to serve its purpose equally well during the day and at night. The key factor here is lighting that can create a desired ambiance. Avoid cool tones and go with warm, incandescent lights and you don’t necessarily have to stick with ultramodern, stainless steel fixtures. For instance, a sculptural piece in bronze colour will be a beautiful yet almost unnoticeable element during the day and a functional light at night. Designing your own modern garden will add tons of appeal to your outdoor space and make it a go-to place for all your fun gatherings and siesta times. Simply follow the tips outlined here and you’ll have a gorgeous garden that will stand out above the rest!